I am so IN LOVE with our Stampin' Up! Memories and More Card Packs! These amazing card kits were designed to be used in scrapbooks, but they can be used in so many other ways. In fact, we have brand new Memories and More Cards and Envelopes that are designed to be the perfect match for these gorgeous cards. This month at my August Inspiration Night, I shared projects I had created with the Tea Room Memories and More Card Kit The entire class required very minimal prep. There was a tiny bit of stamping, a tiny bit of cutting and a all could be put together in a matter of minutes! Don't you just love it when that happens? Most of the cards used a 4 x 6 Tea Room Memories and More card as a background card. They all had a 2 x 3 card layered on the front behind the focal point and some, like the card below had a 2 x 3 card that was attached horizontally in the center to create a band. The only paper I cut for all of these cards was a 2 1/4 x 3 1/4 copper foil that I layered behind the center vertical Memories and More card. The butterflies all came from the sticker sheets that come in the kit and the only other thing I added was Jewel Rhinestones. The next two cards contains all the exact same measurements as the card above. It looks as if I did some stamping or coloring on the front of these cards but everything you see was already printed on the beautiful Tea Room Memories and More cards. Just like the first card, I just added stickers and rhinestones! The final card had some stamping with the Time for Tea Stamp Set. 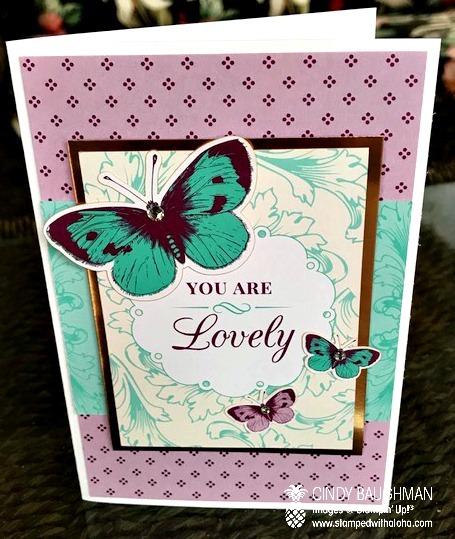 I colored the stamped image with Stampin' Blends and then layered it on to a 2 x 3 Memories and More card. The rest of the measurements on this card are the same. The only difference is, I didn't add a second 2 x 3 card horizontal band as in the cards above. I did add a flower sticker and a Jewel Rhinestone though! The final project in this set was this adorable Tea Tin. These cute tins are a part of the Tea Room suite. For this project I took a 4 x 6 card and cut it lengthwise to create a band to wrap around the tin. I then cut down one of the 2 x 3 cards a tiny bit so it could add a pop or green to the front of this project. I then stamped a sentiment and punched it out with a 2" circle punch that was layered onto a Copper Foil that had been punched out with the Starburst punch. I tucked in a few of the pretty flower stickers and added a Jewel Rhinestone to the center. When I shared these projects at Inspiration Night, everyone reacted in such a positive way! I got lots of great feedback on how much they loved creating these quick and simple projects. Many shared that they didn't even realize we sold the Memories and More Cards and Envelopes! It was fun to point out this hidden gem that was already a part of our Stampin' Up! catalog. I was SO impressed in working with the Memories and More cards that I used them to design all the projects in our upcoming Holiday Stamp Camp! YES, can you believe it?? The holiday are right around the corner and our Holiday Stamp Camp is coming soon. It will be held on Saturday, October 27th at the Kroc Center in Kapolei. I'll have more information out soon but for now, please save the date. You will FLIP when you see how beautiful our Christmas Memories and More cards are! If you are not into scrapbooking, it is highly likely that if you saw these cards you probably skimmed right past them not even realizing the potential they had! I hope that you can now see how easy it is to use these beautiful cards. If you haven't tried them yet then now is a great time to order them because we have only a few days left of our Bonus Days special. When you place a $50 order in August, you will receive a code that will give you $5 bonus dollars to spend next month. Don't miss this great special or dare I say, perfect "Opportuni-TEA"!! !